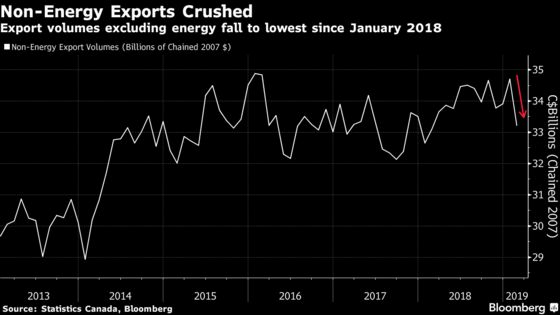 (Bloomberg) -- Canada recorded smaller trade deficits than expected in the first two months of 2019 on a rally in oil prices, but figures released Wednesday show the nation’s exporters are still struggling. The nation posted a smaller-than-expected C$2.9 billion ($2.2 billion) deficit in February, and Statistics Canada revised down its initial deficit forecast for January by C$1 billion. Yet, the improved trade balance reflected stronger crude prices and masked what seems to be a deteriorating outlook in just about every other sector. The stagnant trade performance will need to change if the nation’s economy is to emerge from its current soft patch. Exports in the non-energy sector fell 4 percent in February and dropped to the lowest level in 12 months. In volume terms, the drop was even larger at 4.5 percent. Total exports are still down more than 6 percent from record highs last July, and the slump is one of the main reasons why Canada’s economy has practically stalled over the past six months. Even with the smaller than expected deficits in January and February, the nation’s trade gap is hovering near historic highs. All of this is beginning to undermine business sentiment, hampering investment and threatening to spillover into other parts of the economy. Earlier this week, the Bank of Canada warned the recent economic slowdown and global trade tensions were beginning to hamper confidence. Wednesday’s report included revisions that showed better export numbers in nominal terms in January -- with a revised 5.3 percent gain that month -- followed by a 1.3 percent drop in February. While not as bad as exports, imports too have been sluggish, suggesting the problems in the export sector are part of a broader curtailment of trade flows. In nominal terms, imports were down 1.6 percent and little changed in volume terms.